Definition: A hyperbolic surface of genus g is a topological surface of genus g along with a metric that is locally isometric to the hyperbolic plane. Equivalently, it has a Riemannian metric of constant curvature -1. There are some distinguished types of curves on a hyperbolic surface, and I don’t just mean the geodesics (though we’ll relate them to geodesics). This is going to be a definition heavy post, but hey, we’re doing a construction, this tends to happen. Definition: A closed curve is peripheral if it freely homotopic to a boundary component of the surface. It is essential if it is neither peripheral nor contractible, and we will ALWAYS assume that closed curves are essential, because otherwise they don’t give good homotopy classes. A closed curve is simple if it is the image of an injective map . A key observation, that isn’t particularly difficult, is that each free homotopy class of curves on has a unique closed geodesic in it. So we will speak of THE geodesic representing a free homotopy class. It’s also not so hard to see that if is a simple closed curve, the geodesic representing its class is also simple, and if represent different free homotopy classes, both are simple, and they don’t intersect, then their geodesic representatives don’t intersect. So we can reduce a LOT of questions to just looking at geodesics. So a procedure we can do is take any simple closed curve, replace it by the corresponding geodesic and then cut the surface along that geodesic, getting a new surface with two geodesic boundary components. This can happen in two ways, either it can separate the surface into two surfaces, whose genera add up to the genus of the original and each with one extra boundary component, or else it can decrease the genus by one, but increase the number of boundary circles by two. Remember these operations, we’ll see them again in other forms many, many times in the study of moduli! Why is it the simplest one? There are no essential curves! Every simple closed curve on the pair of pants is either freely homotopic to the boundary or is contractible. So what we do is we take a maximal set of disjoint simple closed geodesics on our surface, and that will give us a pair of pants decomposition. 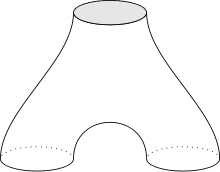 A compact surface has Euler characteristic and a pair of pants has , so that tells us that we need pairs of pants to decompose a genus closed surface, and that means we need geodesics. (for those with any familiarity with this stuff, these numbers should look eerily familiar…and that’s absolutely no coincidence. Let’s finish by looking at the combinatorial type of the pair of pants decomposition, which will be very similar to some things from dual graphs of stable curves that we’ll get to in 2015 at some point. The combinatorial type is a graph with vertices for each pair of pants and an edge for each boundary component connecting the two components that it’s the boundary of. Any trivalent graph with vertices arises as the combinatorial type of some pair of pants decomposition of a genus closed surface. Next time, we’ll talk about coordinates and actually build Teichmüller space itself. This entry was posted in Uncategorized and tagged hyperbolic geometry, hyperbolic surfaces, teichmüller space. Bookmark the permalink.